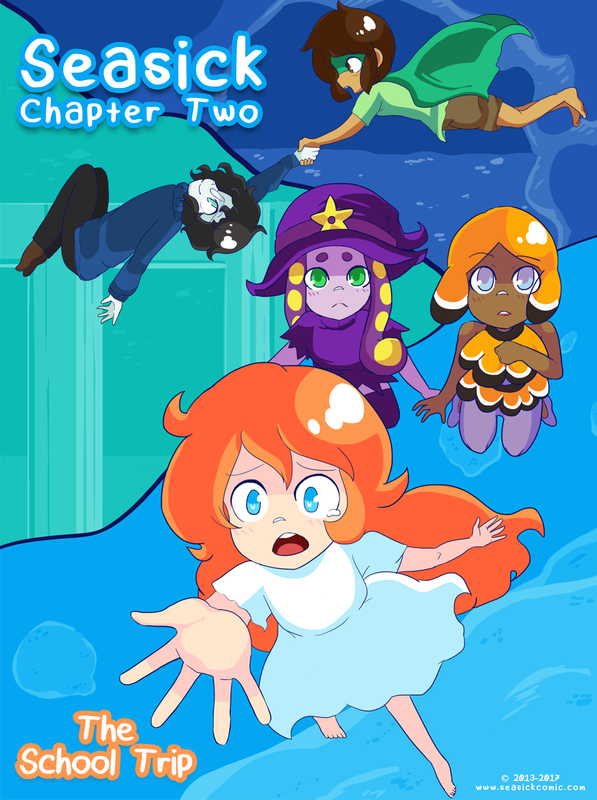 chapter-two-cover – Seasick – The Underwater Adventure Comic. Updates Fridays! on May 26, 2017 and modified on May 26, 2017. CHAPTER TWOOO. OH MY GOD IT’S BEEN LIKE 4 YEARS. But my life was kind of all over the place that time! I really want to get things more stable! For now, for those that don’t know, Seasick will update on Fridays for a bit to give me time to re-acclimate! My plan is to move it up to twice a week and leave it there so I can a) make sure it’s at a better quality than I was able to time-afford before and b) give myself time for other projects in my pipeline. I think the only way I was able to do it three times a week before was because I really really REALLY wanted to finish Chapter 1. It was meant to introduce the characters and set the tone and I feel like we’re way past that now and ready to move on!! 😀 SO. I hope you enjoy the chapter cover! Sorry that Mina doesn’t look happy, I know some people won’t like that.